For private houses and country houses, there is no material more affordable and easy to use than timber for construction. Any job of that kind would not be complete without timber; it is easier to build a gazebo, benches with a table or a wooden porch from scratch than preserve them from negative effects of the rain and sun. The entrance to the house is a special spot, so finding the material and the method of application – what’s best to use to paint the wooden deck – always remains a problem. The most common mistake when painting a deck is an improper selection of coating material for its wooden steps. If you simply use one of the most affordable and inexpensive varnishes for both platform and steps, for example, alkyd or acrylic varnishes, after a few months of use, a dark-color strip will emerge on the platform and the steps. Sanded wood is abraded to fibers which accumulate microscopic soil particles and dust. Note! In order to remove the dark marks from the wooden surface, you will have to re-sand the steps and paint them with a new coat of paint or apply varnish. After the third sanding, a dent will appear on the surface of the steps and the platform of the wooden deck, and now you can only paint it and cover it with a rubber mat, which will ultimately spoil the appearance of your pretty deck. That’s why the steps and the upper platform must be painted with a durable material; the best option of all is deck paint or varnish. If it is out of your price range, you can use a conventional polyurethane, acrylic-polyurethane or epoxy varnish for parquet floor. As noted on PrizedReviews, best deck paints are not affected by moisture and bright sunlight. Besides, if the porch is built properly, the moisture will evaporate from the surface in no time, so there is practically no risk of wooden steps swelling. It is best to apply varnish that is transparent or tinted old walnut. In this case, it is easier to find cheaper varnish of similar toner. You can paint the whole deck with epoxy or polyurethane varnish, but there is no point in doing that, as the paintwork will cost you a pretty penny. Water-dispersible and water-based paints are not recommended for such use. You can, of course, paint the old wooden deck with bright facade paint, but it will not look very attractive; besides, the floorboards and steps will still require application of a more durable material. You should not try to paint a wooden deck with nitrocellulose paint: it is the worst option of all. Yes, the coating dries up quickly and the paint is easy to apply, but you get mediocre quality, especially that nitrocellulose paint loses its protective properties pretty quickly. The oldest tested material for wooden surfaces is a good quality oil-based paint. The disadvantage of oil-based coatings is their low resistance to wear and a very long drying time. Even modified oil-urethane coatings are not very durable and they dry for a long time; besides, the range of colors leaves much to be desired. Oil-based paint can be used for the most critical elements of your wooden porch, including the floor and the supporting structures. Acrylic or acrylic-urethane varnish is considered the most suitable for wooden parts of the deck. To provide protection from moisture and ultraviolet radiation, it will be necessary to paint the wood at least three times, with 6-7 hour intervals. High-quality acrylic varnish is expensive, therefore, before painting a wooden deck, the surface should be treated with an acrylic primer; worst case scenario – dilute PVA with water in 1:4 ratio. A sanded wooden surface acquires a thin film that ensures the minimum penetration of varnish into the wood, and, at the same time, it evens out the bonding of the acrylic coating with the wood. If you use varnish by itself, the consumption of the expensive material will double. The only drawback of acrylic coatings is the hardness of the layer. If you paint a sanded wooden surface of the railings or the handrails scarcely, you will get a serious problem: dry, hard-as-glass splinters. 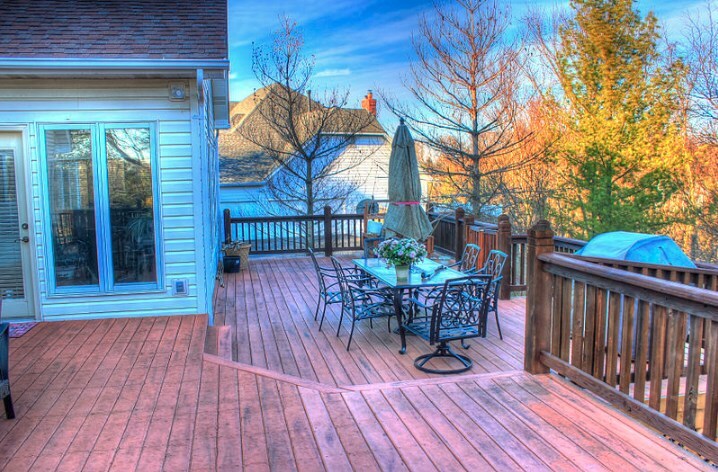 Alkyd enamel, or varnish, is considered one of the most popular and affordable materials for deck treatment. Most country house owners prefer to paint the porch, the fence and the walls of the sheds with pentaphthalic PF-115. The paint for exterior structures protects wood from moisture and heat pretty well, but durability of the coating is far from perfect. A freshly built porch can be painted with alkyd varnishes. If you apply the second or the third coat over the old paint or oil, the overall quality of paintwork will not be good enough. It is not necessary to use alkyd or expensive acryl-polyurethane varnishes to protect wood structures. The modern chemical industry offers a fairly large number of custom materials: for instance, special wax-based gels. You can use it once and forget about it for ten years. The only drawback is their relatively complex application. If it usually takes you two hours to paint the deck with alkyd varnish, wax putty and gels require mechanical polishing of the texture. The result is a very beautiful and durable coating with semi-gloss. If the wooden deck is built of wood that has a beautiful texture of fibers, it makes no sense to lose the natural beauty and try to paint it with oil-based paint, it is better to use gel or wood impregnation. The second most popular material for treatment of exterior wood structures, the floors of the terraces and verandas are oil-type wood preservatives. Simple wooden decks can be treated with natural drying oils; it is better not to use polymeric-petroleum grades. It takes at least a week for drying oil to get dry, and it becomes touch-dry within two days. If the porch was built in the location with a lot of shade around it, it is best to choose the wood preservatives by Tikkurila. If you paint the wood according to all the instructions indicated on the can, you will get one hundred percent protection from moisture. Apart from that, wood preservatives outline the natural beauty of wood fibers. One of the criteria for selection of the material to paint porches and wooden terraces should be the quality of varnish or paint. For example, there are plenty of yacht varnishes that are advertised as deck stain – the best material for painting exterior wooden structures. A real deck stain does not provide gloss and it is almost completely transparent or tinted gray.